If you follow us regularly, you know that we are smack dab in the middle of the Whole 30. You can read about it here. While we aren't following the diet strictly with Jacob, he is enjoying many of the snacks and meals we're having and we're trying to make better decisions in general about what we feed him. I was overjoyed when I found out one of his favorite snacks now comes in a more natural variety. We were making a Walmart run to re-stock on some of our Whole 30 fruits and veggies when I found Snack Pack Naturals. These are brand new and I was excited to try them out, since I'm not fond of giving Jacob all the sugar normally found in pudding. 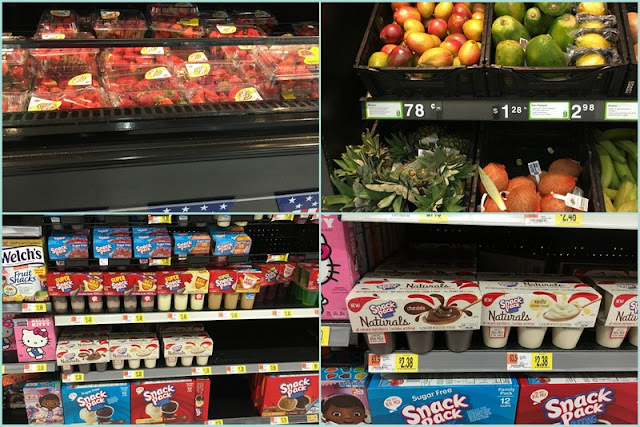 I knew instantly that combined with some fresh fruit, they would make a tasty "ice cream" pop that Jacob would love and that would be better for him than the sugary varieties, since there are no preservatives or high fructose corn syrup added to the pudding. We had already grabbed some strawberries and mango, so I picked up both chocolate and vanilla pudding to pair with them. Making a simple fruit purree is a great way to sneak more fresh fruits into your kiddo's diet. All you need is your fruit and a little water. I used strawberries and mango, but a wide variety of fruits would work. I started by chopping my strawberries and adding them to our food processor with just a few teaspoons of water. I set the processor to chop first, then grind. The key here is to continue blending until the mixture is completely smooth. Once it was a smooth puree, I poured it out into a bowl, rinsed off the processor, and repeated my steps with the mango. Once the purees were made, it was time to start layering them in with our pudding. 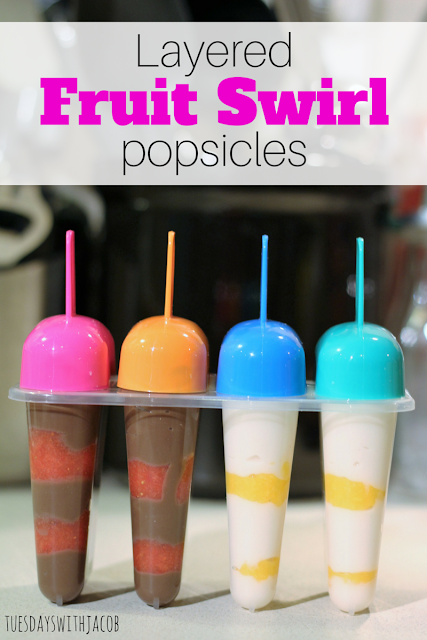 I filled each popsicle mold with a layer of Snack Pack Naturals in chocolate and vanilla, then added a thin layer of fruit puree. I then repeated the process until the entire popsicle mold was full. Once they are completely full you can add your lids back on and place them in the freezer. The popsicles take a few hours in the freezer to completely firm up, and then they are ready to be devoured! They're the perfect treat for a hot summer night, and the best part is that you don't have to feel guilty about giving them to your kids. Jacob had no idea these popsicles were better for him, he chowed right down on his special after dinner snack. Here's to making smarter choices, for us AND for our kids! You can check out many more Snack Pack Natural recipes HERE! And here's a handy pin for you!